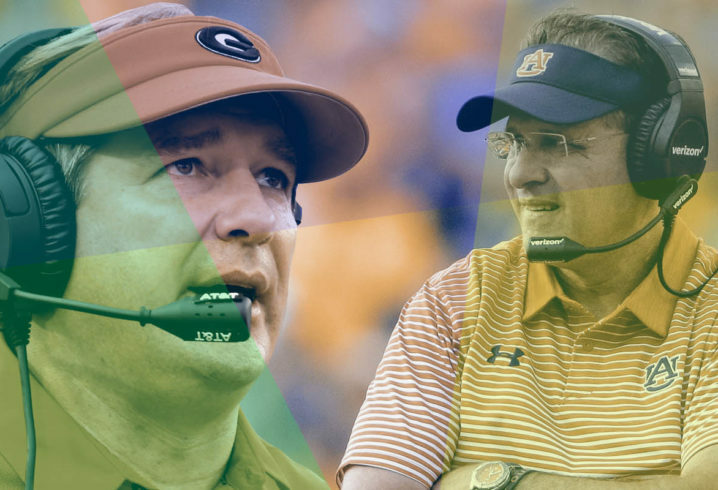 In any given year, the Auburn-Georgia game should need no introduction: They call the thing “The Deep South’s Oldest Rivalry” for a reason, and one of the reasons the series has continued to resonate through the years is that at least one side almost has something beyond local pride at stake — a division crown, at least, occasionally accompanied by a bid for national relevance on the horizon. 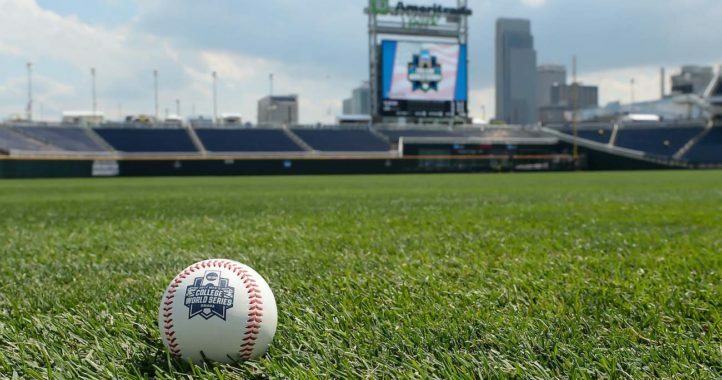 It tends to land on the sweet spot on the calendar when good teams begin to emerge as great ones, or don’t, and begin their descent toward a mediocre bowl. A lot can come to a head in these games. 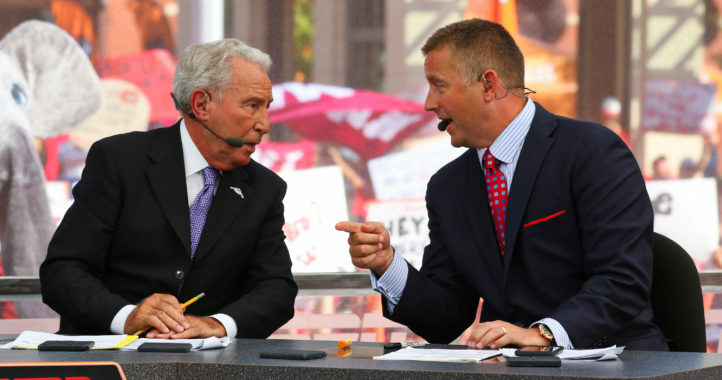 But Saturday’s installment of the rivalry, especially, is one that should speak for itself. Georgia is undefeated in the month of November for the first time in 35 years, ranked No. 1 in the Playoff committee’s weekly rankings, and already assured a slot in the SEC Championship Game. Auburn has lost twice, but in respectable enough circumstances — by single digits, on the road, against quality opponents — that the committee still saw fit to elevate the Tigers to No. 10 after last week’s 42-27 romp at Texas A&M; from there, it’s still possible for them to win the SEC West with upsets over Georgia and Alabama, and possibly to crash the Playoff field with a second win over the Bulldogs in Atlanta. It’s not likely, but it is possible. It’s a path that exists, which, for now, is all that really counts. In fact, as far as Vegas is concerned handing Georgia its first loss would barely qualify as an upset: The Bulldogs opened as mere 1-point favorites on the road (the line has since risen to Georgia –2.5), a reflection of just how similar these teams really are. Both sides boast a blue-chip, top-10 defense that’s particularly nasty against the run; both also lean heavily on the run on offense, and feature between them arguably the SEC’s three best running backs. Both sides are invested in young, first-year quarterbacks with enormous potential and enormous question marks in a game of this magnitude. Athletically the rosters are virtually identical. They also have in common the fact that neither side has won anything significant with anyone on those rosters playing a notable role, or been as well-positioned to as they are right now. For one of them, that will still be the case on Saturday night, at which point the possibilities for the rest of the season will be wide open, Playoff and all. For the other, the path will either be severely narrower (in Georgia’s case) or cease to exist at all (in Auburn’s). In other words, it’s a do-or-die SEC game in November, which is all that really needs to be said. 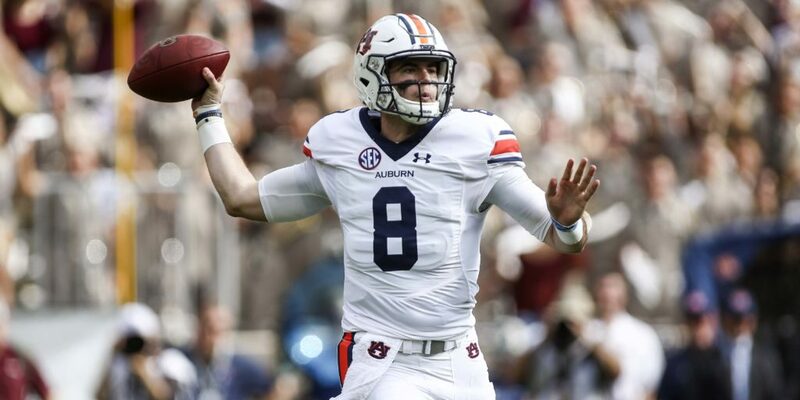 On the whole, Jarrett Stidham has been exactly the player Auburn hoped he would be: Nine games in, the former Baylor transfer leads the SEC in completion percentage (66.8) and comes in well above average in yards per game (221.8), yards per attempt (9.1), and overall efficiency (156.8). He’s flashed arm strength, almost singlehandedly reviving the deep ball as a viable aspect of the offense, and consistency, converting a higher rate of his third-down attempts into first downs than any other SEC quarterback. He’s been respectable enough in the zone-read game — not great, but functional, and improving. Based strictly on his arm, he’s Auburn’s most productive passer and best pro prospect at the position since Cam Newton. All as predicted. As good as Stidham has looked when things are going well, though, when they’ve gone poorly the result has been more like a full-fledged meltdown. At Clemson, Stidham was hounded and sacked so often that by the end he looked like he’d succumbed to shell shock; he finished with 37 yards of total offense (including negative yardage on sacks) in the kind of 14-6 loss that never felt remotely as competitive as the score suggests. At LSU, he followed a brilliant first quarter with an abysmal finish, going 2-of-17 passing for 21 yards over the final three; Auburn blew a 20-0 lead and plummeted 11 spots in the subsequent AP poll amid hand-wringing over whether Gus Malzahn had lost his edge as a play-caller. The mood swings on the Plains have been stark. The current mood is up, on the heels of back-to-back wins at Arkansas and Texas A&M, and if you’re feeling generous it’s possible to write off the collapse at LSU as an aberration: In its other five SEC games, Auburn scored at least 42 points and won by at least 15 in all five. The toughest opponent in that span, Mississippi State, limped back to Starkville in Week 5 the victim of a thorough, 49-10 beatdown. (The Bulldogs haven’t lost since.) In the wins — and in the early going in Baton Rouge, lest we forget — Stidham has enjoyed reliable run support and looked as comfortable in the offense as if he’d been running it for three years, rather than three months. It doesn’t look exactly the same as it did during Auburn’s most recent SEC championship runs in 2010 and ’13, because Stidham is a different quarterback. But when it has clicked it’s tended to go off in the same big, explosive way. On film there’s as much pre-snap motion and misdirection and long-developing trickery as ever. It’s convincing. Convincing enough to bank on Stidham carrying the day against Georgia’s defense if he doesn’t have reliable run support? Not so much. As always, the Tigers’ first and last priorities are to establish the run, which this year has meant a steady diet of junior Kerryon Johnson: Despite a nagging hamstring injury, Johnson has embraced the workhorse role, averaging an SEC-best 23.7 carries per game in the absence of last year’s between-the-tackles bruiser, Kamryn Pettway; including receptions, Johnson has logged at least 30 touches in three of the past four. With Pettway out indefinitely, sophomore Kam Martin coming off an injury of his own, and Stidham limited as a runner to the odd option keep, the ground game has been increasingly Johnson or bust. 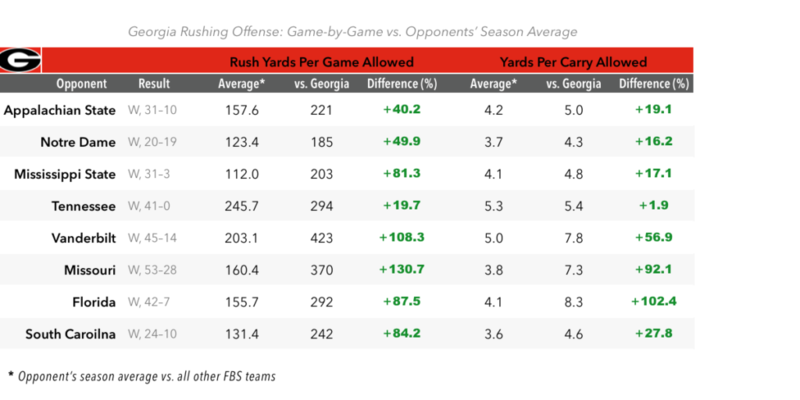 Given the track record of Georgia’s front seven so far this season, it’s hard not to reflexively land on “bust.” Every other offense the Bulldogs have faced certainly has: Even Notre Dame, which has easily rolled over the rest of its schedule to the tune of 358.5 rushing yards per game, managed a paltry 55 against Georgia on just 1.5 per carry. There’s some minor concern over the secondary, based mainly on the fact that it allowed a pair of long touchdown passes against Missouri on Oct. 14; the opposing quarterback in that game, Drew Lock, is the only draftable, “pro-style” passer the Bulldogs have faced to date, and therefore the closest analog to Stidham. Aside from the two deep strikes, though, Lock didn’t do much more damage than that before garbage time, and against everyone else the secondary has been effectively on lockdown. Braden Smith is the veteran anchor of Auburn’s front, the Tigers’ highest-graded player on either side of the ball according to Pro Football Focus and the only member of the line to start in the same position in every game this season. (Fellow senior Austin Golson has started in every game, but in four positions; against Georgia he’s penciled in at left tackle for the second consecutive week.) Smith is a frequent puller, most notably on Auburn’s signature buck sweep, and a significant chunk of the running game is aimed right down the seam of his pants. On the other side, Roquan Smith is to Georgia what Reuben Foster was last year to Alabama: A heady, dialed-in technician in the middle of the defense who also happens to be a blue-chip athlete, a combination that leads to some eye-opening results. Smith is the Bulldogs’ leading tackler by a wide margin, diagnoses plays with alarming speed and closes on runners just as quickly. He’ll be a first-round pick next year, if he decides to leave early, and if Braden Smith or anyone else for Auburn manages to neutralize him on a consistent basis he’ll be the first. 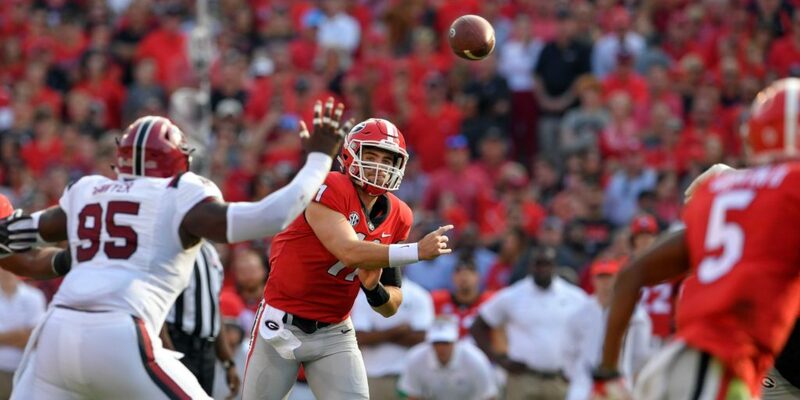 At this stage in his career, it’s impossible to separate Jake Fromm’s efficiency as a passer from Georgia’s week-in, week-out success on the ground, and unless the plan on Saturday goes horribly awry it’s going to stay that way. You couldn’t dream up a friendlier scenario for a true freshman quarterback: The Bulldogs run more often (on 72.7 percent of all offensive snaps) than any other Power 5 offense except the triple-option attack at Georgia Tech, and have succeeded in putting every single defense they’ve faced on its heels. 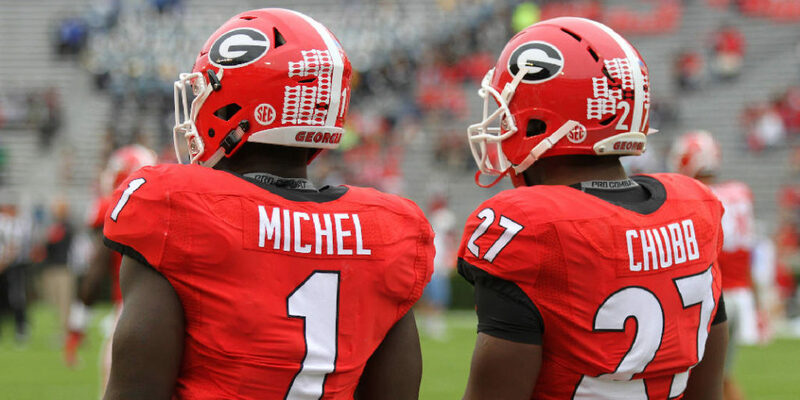 That’s exactly the kind of dominant track record Georgia envisioned when Nick Chubb and Sony Michel opted to return for their senior seasons, due in no small part to their health — this year is the first since they arrived on campus that both Chubb and Michel have both remained at full speed, at the same time, for more than a couple of games. It’s also a byproduct of the Bulldogs’ enviable depth behind the headliners, which has significantly reduced wear and tear. Despite reduced workloads overall, Chubb and Michel are both on pace to eclipse 1,000 yards in the regular season (not including whatever they’ll add to that in the SEC Championship and bowl games), with the underclassman trio of D’Andre Swift, Elijah Holyfield and Brian Herrien chipping in an additional 88 yards per game between them. Don’t expect to see much of the fourth- and five-stringers against Auburn, but their reliable production in blowouts is a key reason that Chubb and Michel are hitting the stretch run as fresh as they’ve been at any point in their careers. (Do expect to see plenty of Swift, a short, powerful, 5-star freshman who’s emerged as the best receiver out of the backfield and would be the feature back right now for a majority of SEC teams; his time is coming in 2018.) Top to bottom, as a unit this one legitimately rivals Alabama’s as the most loaded backfield in the nation. Their success is also a reflection of the stability and cohesion on the offensive line, arguably the most improved unit on the team despite an influx of three new starters — four if you count center Lamont Gaillard, who took a few steps over in the offseason after starting every game in 2016 at right guard. Here, too, health has been paramount: Beginning with the Week 2 trip to Notre Dame, Gaillard, LT Isaiah Wynn, LG Kendall Baker, and RT Andrew Thomas (a true freshman) have started in the same positions in eight straight games, with Solomon Kindley (a redshirt freshman) manning right guard in six of the last seven. Most teams by this point in the season are juggling multiple injuries up front as a matter of course, and shuffling assignments accordingly. Georgia has taken full advantage of its continuity. Which brings us back, inevitably, to Fromm. Is this kid actually good, or what? Short answer: Yes. I mean, probably — he leads the SEC in pass efficiency and ranks third nationally, which in mid-November is not a fluke. Longer answer: Maybe. You know, it depends — he’s also attempted fewer passes per game (16.7) than any other regular SEC starter, or almost any other quarterback who qualifies for the national rankings. It’s an eye-of-the-beholder situation. There have been games where Fromm has looked a fully formed veteran with a firm command of the playbook (Mississippi State, Missouri, South Carolina), games where he’s looked like an erratic freshman (Notre Dame, Tennessee), and games where he was asked to do so little his presence seemed incidental (Vanderbilt, Florida). He’s relegated last year’s starter, Jacob Eason, to an afterthought, but largely by coincidence; if he hadn’t hurt his knee in the season opener, there’s no reason to assume that a healthy Eason would have been any less productive in the same circumstances. Chalk Fromm’s ascent up to “poise,” or to good luck, or to any combination thereof. You’re not wrong. But one fact that is not in dispute is that Auburn’s defense will be the best he’s faced, in pretty much every significant respect. Against the run, the Tigers ranks in top six nationally in Rushing S&P+, Adjusted Line Yards, and Rushing Success Rate. Against the pass, they’ve been just as good, thanks to a long-in-the-tooth secondary and a deep, imposing pass rush that has been far more productive than its sack numbers alone might indicate. The leader up front, junior DE/OLB Jeff Holland, is tied for the SEC lead in sacks, tackles for loss, and forced fumbles, making him a strong All-America candidate even if you ignore the fact that he’s been credited with more than twice as many QB hurries (13) as any other player in the conference. Hurries are an unofficial and notoriously unreliable stat; still, in Holland’s case, that’s not much of an exaggeration of his impact. Just as Georgia’s running game has wrecked the curve against every opposing defense, Auburn has held every opposing offense below its season averages on the ground, too — only Arkansas (171 yards on 4.1 per carry, including negative yardage on sacks) has even come close. At this point, Fromm without the benefit of ground support is a blank slate. Every defense he’s encountered has attempted to put the game on the freshman’s shoulders; Auburn has the best chance yet of actually doing it. Godwin doesn’t touch the ball that often in Georgia’s offense, but when he does he makes it count: 13 of his 19 receptions have gained at least 15 yards, and five have gone for touchdowns, putting him on the short list of the SEC’s most efficient deep threats. (Like seemingly all of Georgia’s wideouts, he’s a perennial candidate to come down with a highlight-reel catch in the red zone, as well.) Opposite Davis, though, he’ll be running against a three-year starter and future first-rounder with a growing list of accolades — Davis was a midseason All-America pick by the Associated Press and earned the highest PFF grade of any defensive player in the nation in Week 5, after he broke up four passes in the Tigers’ win over Mississippi State. At 6-1, 203 pounds, Davis has the long wingspan and solid frame that scouts covet, and which could make life very difficult for the 5-11, 185-pound Godwin if Auburn is feeling frisky enough to isolate them in bump-and-run coverage. Either way, the Tigers will certainly be intent on keeping a safety (most likely former Bulldog Tray Matthews) as near to the line of scrimmage as possible to serve as an extra defender against the run, meaning the corners will be largely left to their own devices as long as Georgia’s ground game remains viable. If UGA averages anywhere near its season average of 6.1 yards per carry on first-down runs, an opportunistic deep shot to Godwin or Javon Wims will remain in play at all times. Auburn’s Daniel Carlson is the SEC’s all-time leading scorer — have you heard about this, Auburn fans? — and although his accuracy has wavered slightly as a senior he remains the league’s best bet from long distance: Excluding a pair of blocks against Texas A&M, Carlson is 7-of-10 on field goals of 40 yards and longer, including three hits from beyond 50. (For his career, Carlson’s connected on a dozen 50-yarders, most among active FBS kickers.) He’s also a reliable weapon on kickoffs, having drilled 54 touchbacks on 65 attempts. To the extent that there’s a disparity on special teams, it’s on the respective punt teams, where Georgia’s Cameron Nizialek has effectively rendered opposing punt returners obsolete: An incredible 31 of Nizialek’s 33 punts have either resulted in a fair catch or come down inside the 20-yard line, where they typically roll dead; only six have been returned, for a grand total of nine yards. Auburn, meanwhile, hasn’t faced many punt returns itself but allowed a backbreaking touchdown by LSU’s D.J. Chark on one of the few that it has. This would usually be the section to discuss notable injuries, of which there are are surprisingly — aside from Pettway’s shoulder injury, both starting lineups are remarkably healthy. Two Auburn offensive linemen, starting RT Darius James and LG Mike Horton, left the Tigers’ win at Texas A&M with lingering ankle and leg injuries, respectively, but hoped to return to practice this week and were still listed as projected starters on the school’s official depth chart. If James can’t go on Saturday, expect LT Austin Golson to take his spot at right tackle and Prince Tega Wanogho, who’s started six games at left tackle, to move back into the lineup on the left side; if Horton is out, he could be replaced by Golson or fellow sophomore Marquel Harrell, who started at LG against Arkansas and has played extensively. 1. Stidham connects on a big play early, leading to Georgia’s first deficit at any point since its Week 2 trip to Notre Dame. 2. Jeff Holland and Georgia’s Lorenzo Carter both record multiple sacks. 3. Both quarterbacks fall into a long, visible slump, averaging less than 7.0 yards per attempt with at least one interception apiece; between them the offenses combine for double-digit punts. 4. Auburn feeds Kerryon Johnson at least 25 carries, but he falls well short of 100 yards rushing. 5. After a quiet day statistically, Chubb and Michel grind out a series of first downs on a late, time-consuming touchdown drive that ices the win; ultimately they combine for more yards than Auburn has allowed in any previous game. Looking forward to a good game. Go Dawgs. It’ll be a good game alright. May go down as a classic. 3 point spread- makes me nervous. Would really love to see Georgia competing for a chance to win the National Title. It’s got every Dawg fan nervous too. Auburn is a great team. If anyone should be on upset alert it’s UGA Saturday. Well written, we researched. Its going to be a war from the first play to the last but I am predicting 35-24 UGA. Our hauses are just too much late in the game for Auburn to keep up. But it could go either way, I just hope it goes our way. Can’t wait for kickoff, I hope the game lives up to the hype surrounding it the past few weeks. Our defense will be fighting for 4 qtrs. All depends on if Gus locks up and grabs play calling duties again. Then were doomed. Should be a great game. I’m glad LSU plays early, so I can catch this one. Kirby Smart has his program on the rise, but it is as good now as it will be in the near future. Upgrades in talent and depth are on the way, but Georgia is already better than every team in the SEC, save Alabama. This UGA team is not leaps and bounds better than this Auburn team, but they are just a little better at just about every position group, and Smart is already looking like a better coach than Malzahn.